Gator Bob’s Trading Post – Let's Go RVing! We got up this morning about 6:15 and for once Jerry had forgotten to fix the coffee the night before so we had to wait a few minutes to really wake up! We puttered around reading e-mail, showering and were ready by 9:00. We were supposed to meet Donna and Ken at 9:30. I couldn’t decide what to wear – didn’t want to be too hot but surely didn’t want to be as cold as I was yesterday. Fortunately I wore a turtle neck along with warm pants and my boots. With my Patagonia coat and raincoat I was warm most of the day. We went directly to the first stop on the trolley tour where we had free parking. 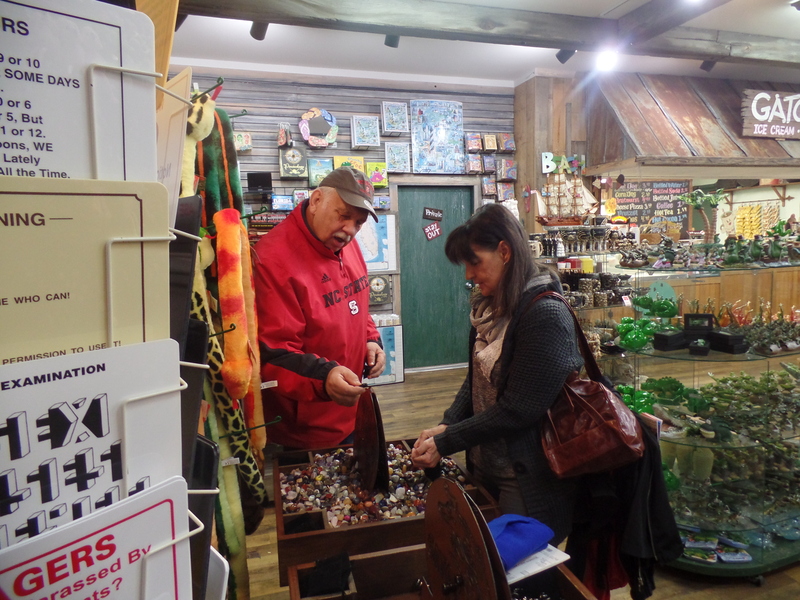 First we went into Gator Bob’s Trading Post. Donna bought a scarf with mittens on each end and Ken brought a cap. Then both Jerry and Donna got very interested in the “gems”. $5 for a bag full so we all spent considerable time selecting just the right stones. Jerry is going to take up a new hobby and start making jewelry! 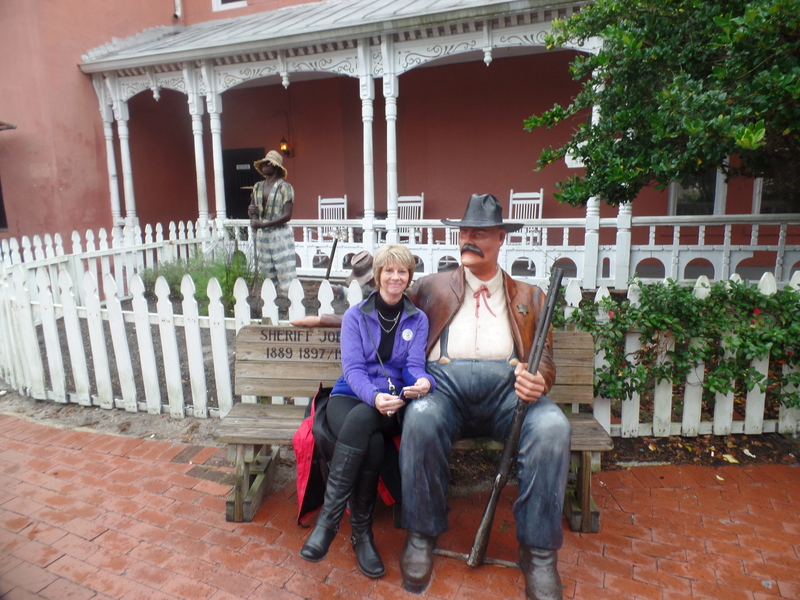 We got on the trolley then and enjoyed a tour of St. Augustine. It began to rain and unfortunately we were seated in the second section so we were getting rain in the face. Glad I wore my waterproof mascara! Ken said there was coffee at the 15th stop so we anxiously awaited that destination. When we found the coffee shop, the Bunnery, they were still serving breakfast so we had an early lunch – breakfast with a couple of cups of warm coffee! We got back on the trolley and finished the tour. When we arrived back at the starting point we took a tour of the Historical Museum and the general store. The guide said that if it wasn’t in the store it wasn’t anything that had been needed. Two ladies posed as period actors and explained the various things in the store. It was quite interesting. Some of the things I remember Mom having or perhaps I remember seeing pictures of them. After that we went on a tour of the jail. The harsh conditions in which the inmates lived was unbelievable. Some cells which were so small you couldn’t turn around in would house up to eight inmates and the temperature could get up to 110 degrees in the summer. Needless to say there were many deaths. We got back on the trolley and rode some more. We had a very good guide, Poppy and we were close enough that we could hear everything he said. We wanted to tour the Presbyterian Church but it wasn’t open for tours so we rode on to the distillery where we were told we wouldn’t have a ride back if we went on that tour so we decided to put both of them off until tomorrow. By the time we got back to the Gator Bob’s Trading Post it was raining again and it was nearly 5:00. A day full of interesting things but time to end the sight-seeing. Donna and Ken came over for dinner again. We had meatballs and I fixed some mashed potatoes – mashed, not creamed as Jerry had to chop them up with the chopper and then mash them with a spoon! Necessity is the mother of invention. Donna had brought over some green beans and I cooked them and then when they came for dinner she brought salad. We discussed what we were going to do tomorrow. Looks like the church, the distillery, the winery, the chocolate factory, Lightner Museum are all on the agenda. Two days is not enough to see all of St. Augustine especially when it’s cold and rainy but it’ll have to do for this trip! Got to FaceTime with Trent and Eva tonight – love my children! Off to bed now. It’s nearly 10:00, the latest I’ve been up since we left home!